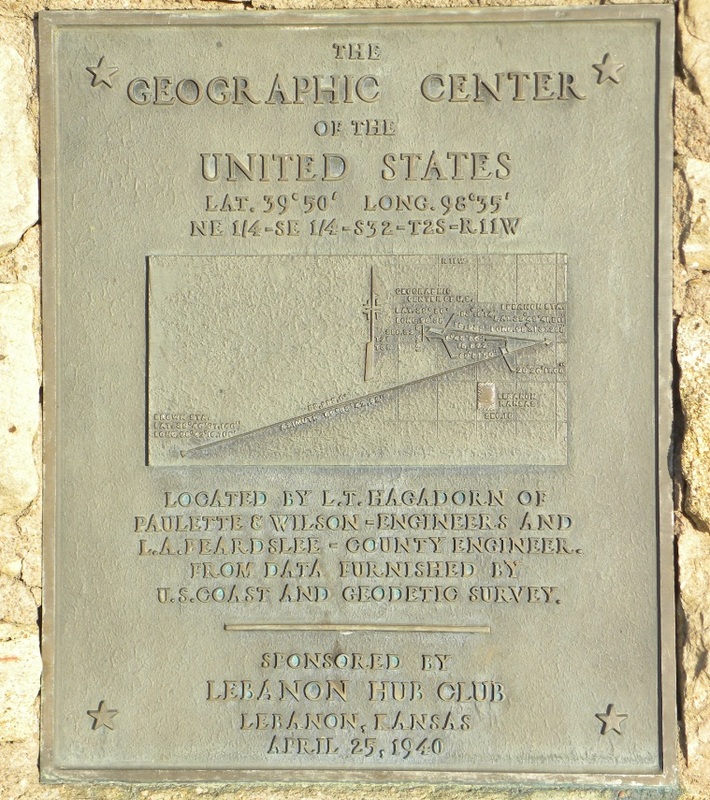 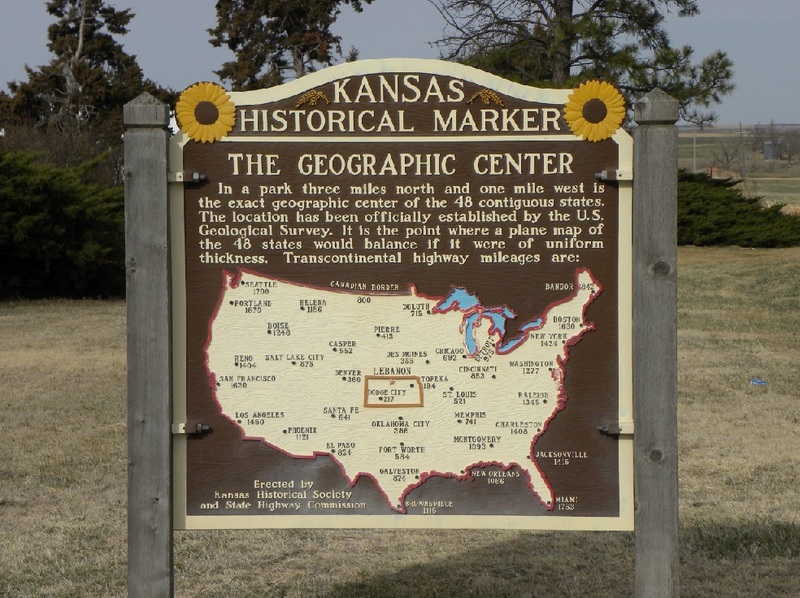 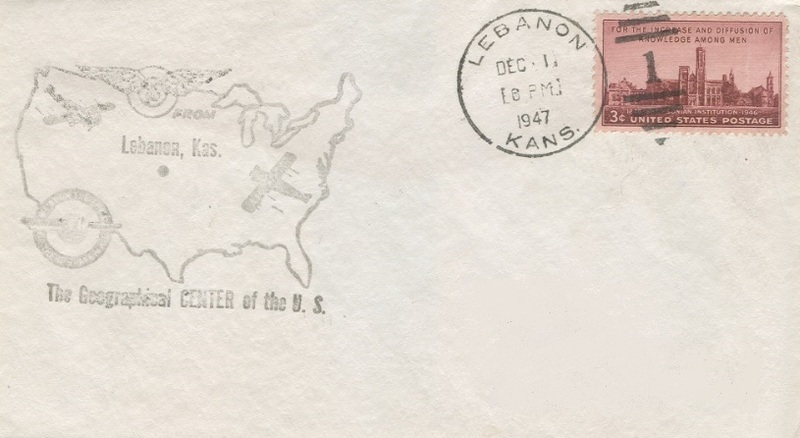 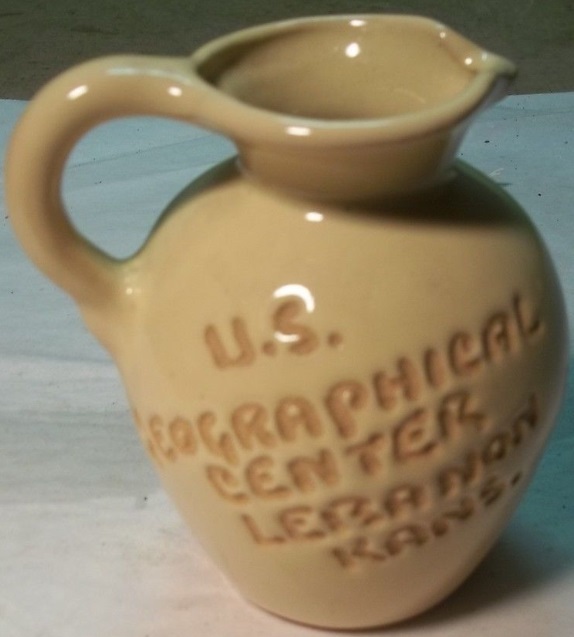 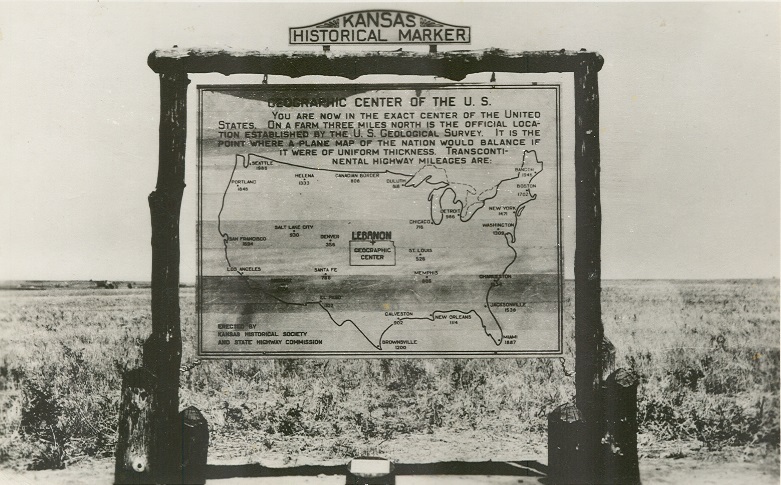 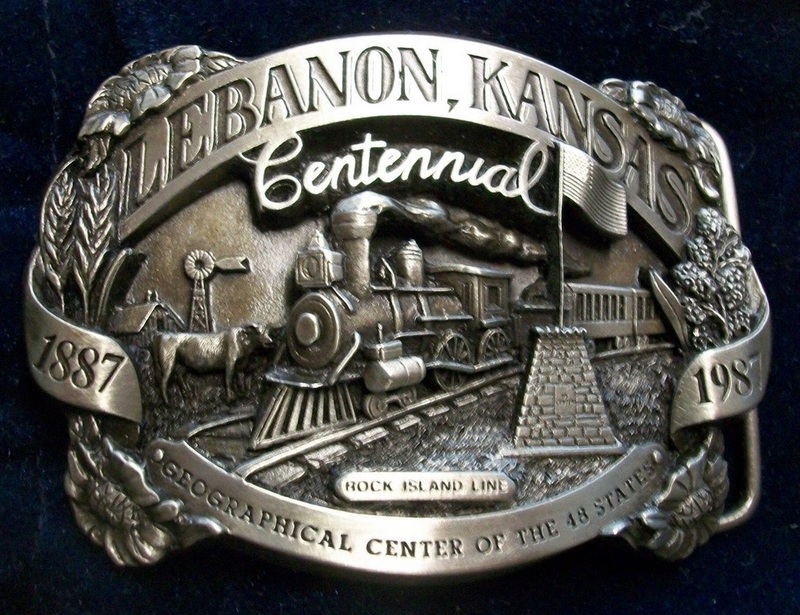 The determination of the Geographical Center at Lebanon, Kansas, came in 1918 when Charles H. Deetz of the U. S. Coast & Geodetic Survey calculated the new location which shifted the focus away from the previous location at Smith Center, Kansas. 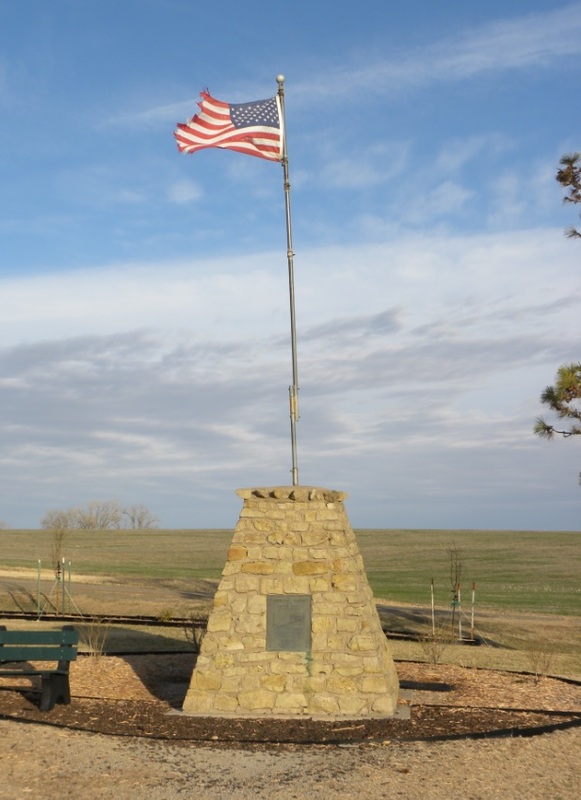 It wasn't until nearly 22 years later that an effort was made to mark the location and place a monument. 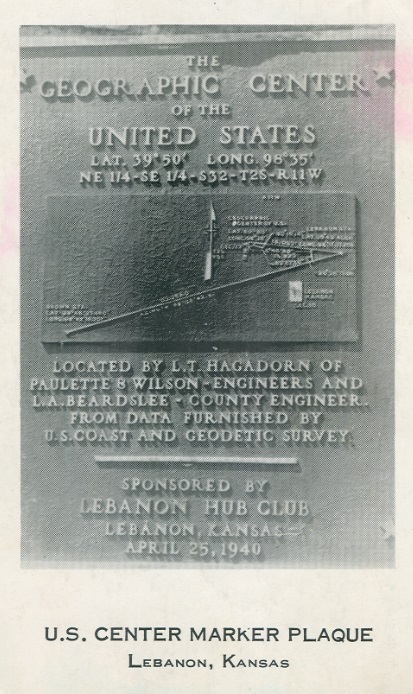 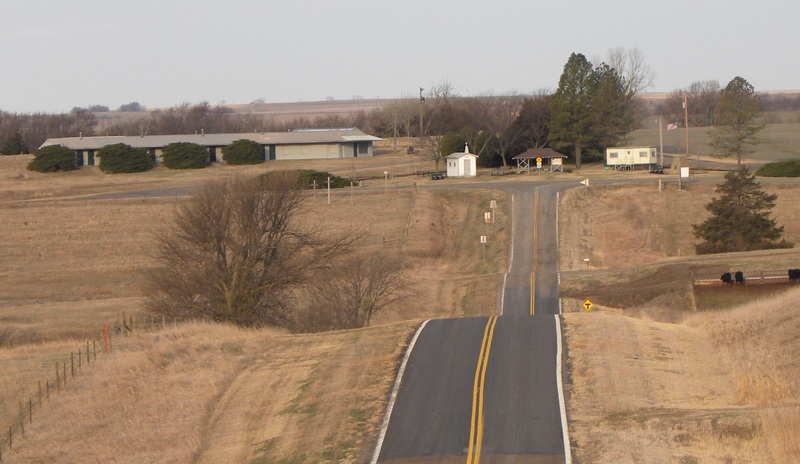 On April 25, 1940, two surveyors from the firm of Paulette & Wilson in Salina, Kansas, determined the exact location by triangulation on the ground. 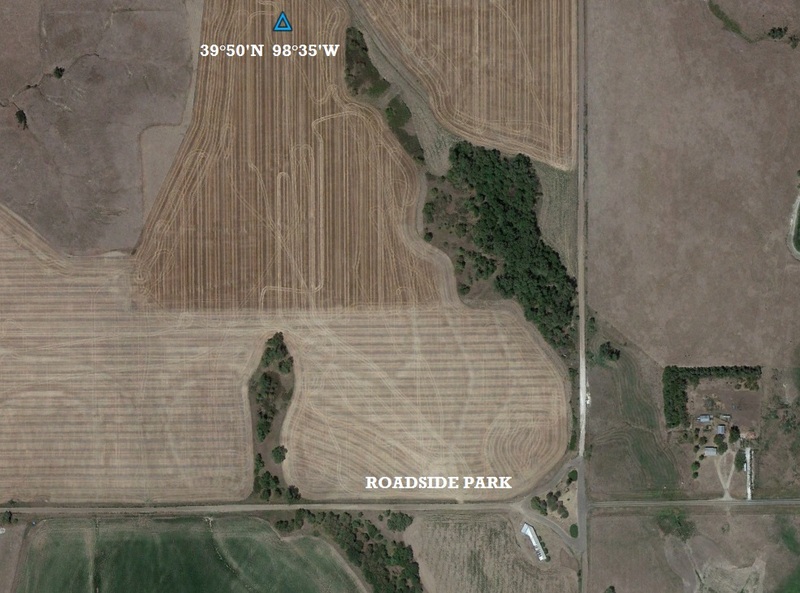 The location through survey measurements, placed the exact location in a cultivated field 600 yards north and 400 yards east of the nearest county roads. 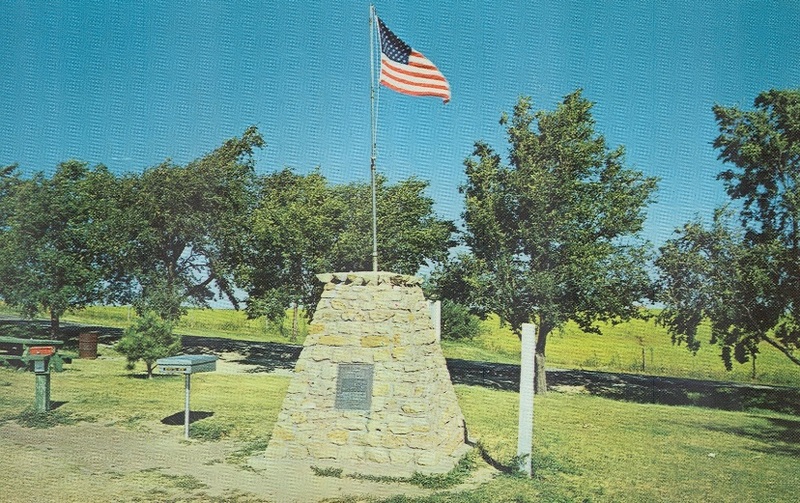 The owner of the land, John L. Grieb, did not want a monument placed in his field, so a decision was made to place it at the nearest intersection 750 yards to the southeast. 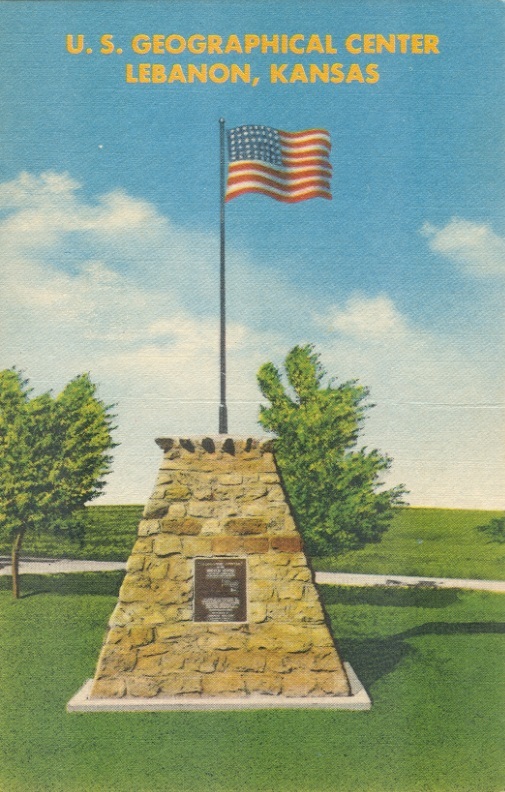 A local contractor named Clarence Beardslee built the pyramid-shaped monument of native limestone during the summer of 1941. 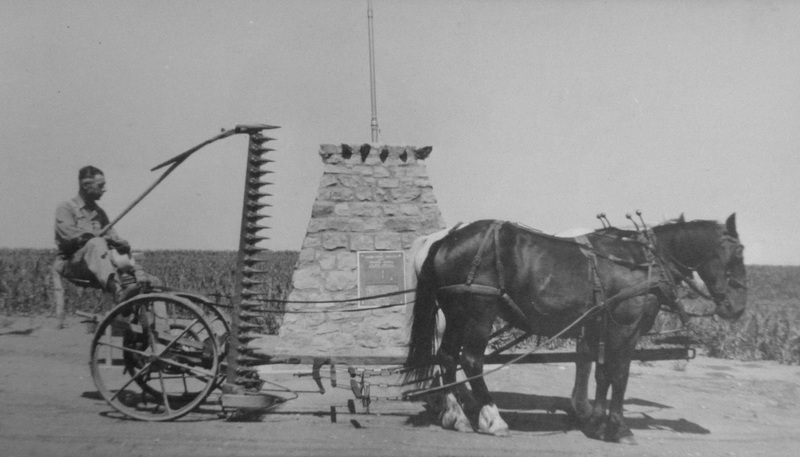 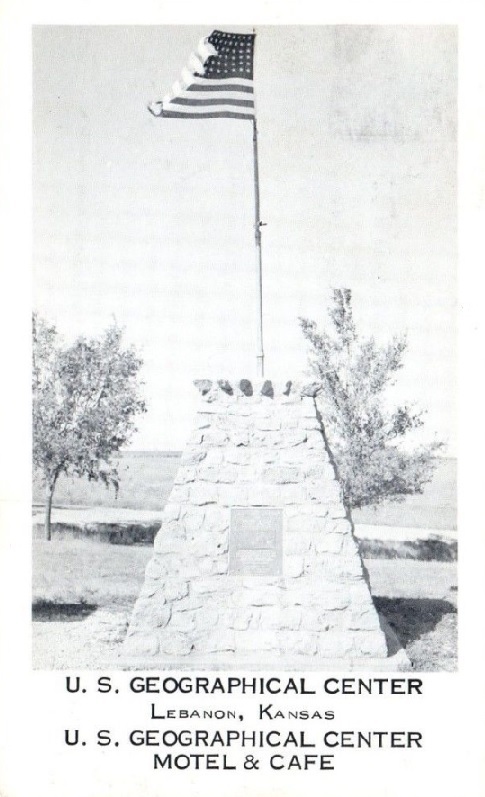 The monument stands 7'-6" tall and measures 6'-10" at the base and 3'-0" at the top. 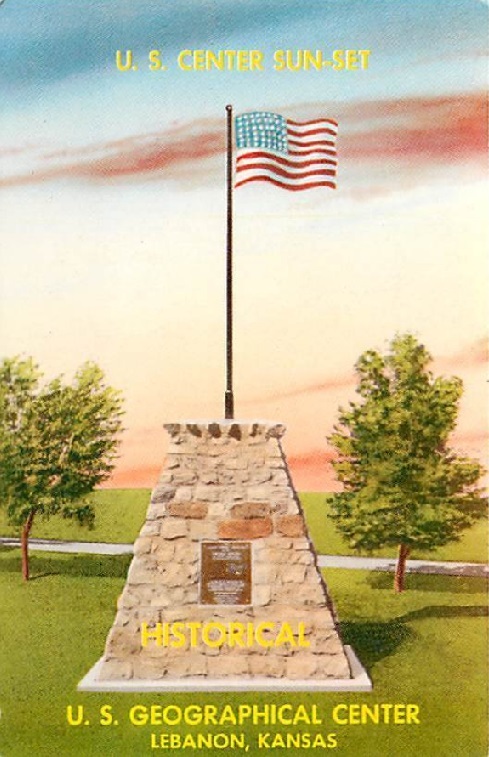 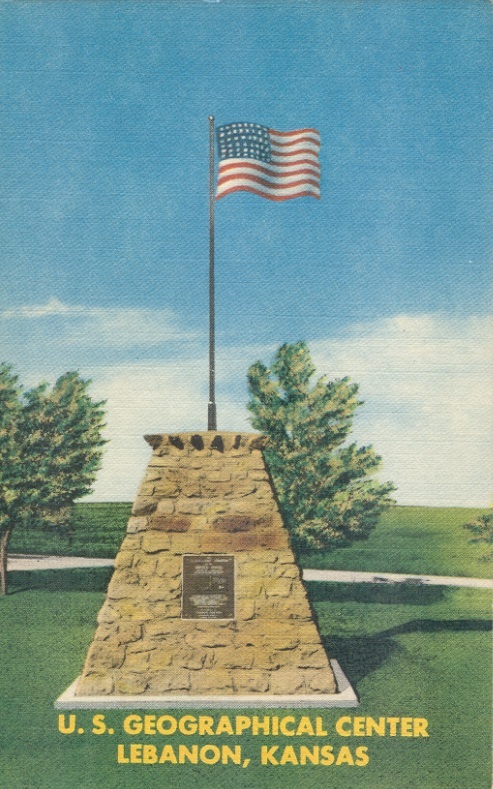 The formal dedication of the monument occurred on June 29, 1941, with an estimated crowd of 2,000 attending the event. 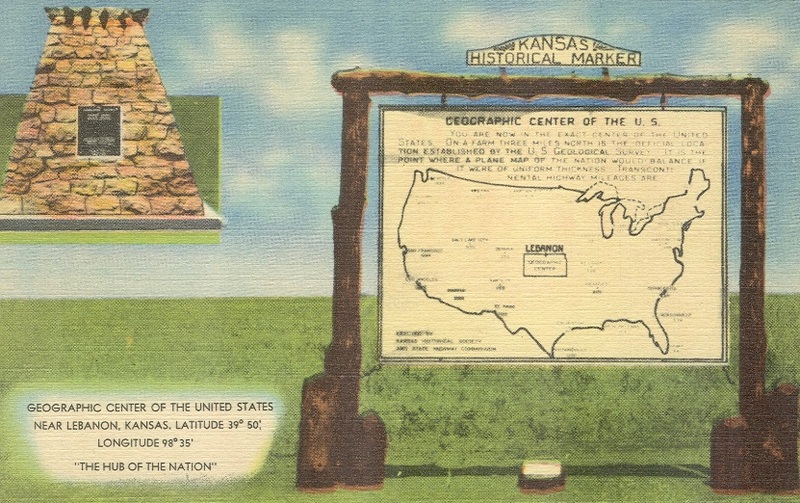 The location of the monument was expanded and named the "Geographical Center Park". 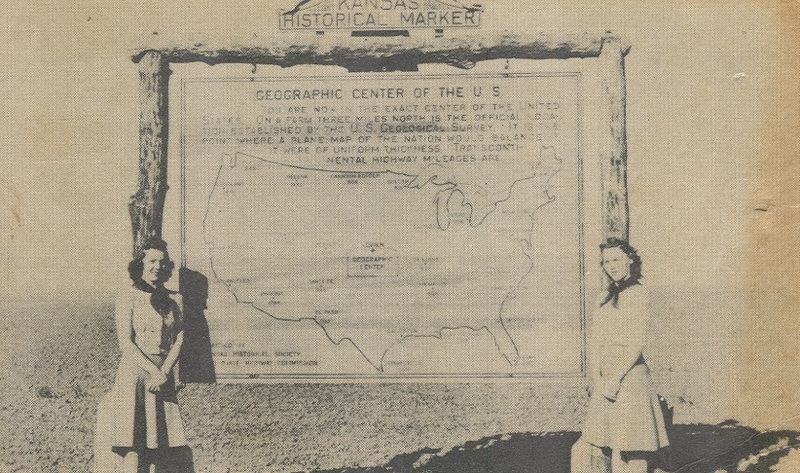 In 1955, a businessman from North Carolina named Moses L. "Lee" Johnson built a motel at the site and named it the "U. S. Geographical Center Motel" which was late renamed the "Center Park Motel-Rest". 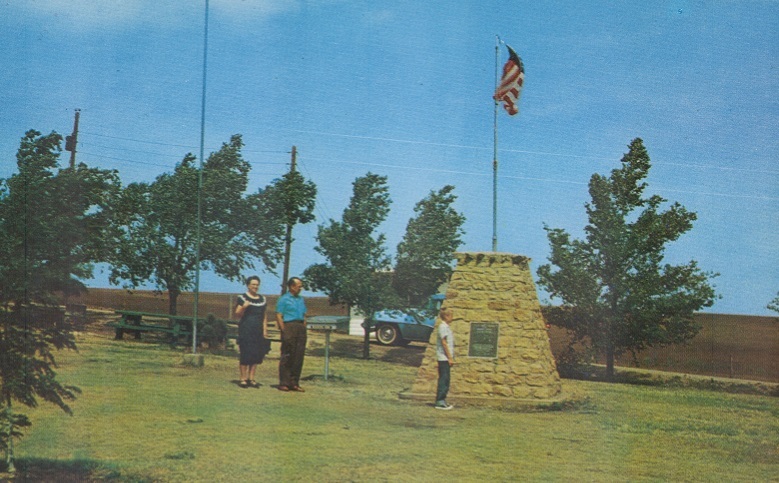 The venture which included a caf� in the motel, was a bust and was closed to tourists around 1959. 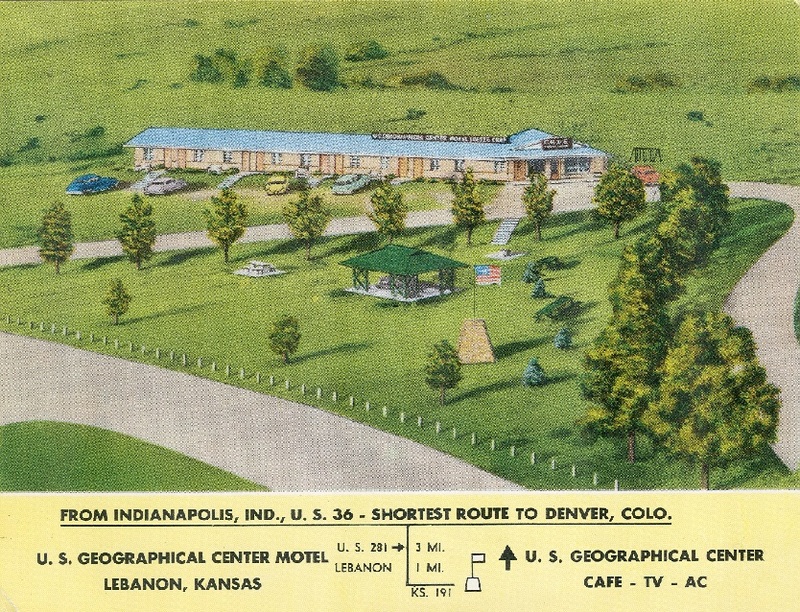 The motel opened off and on for local events during the next decades and was finally sold to a pheasant hunting group in 1985. 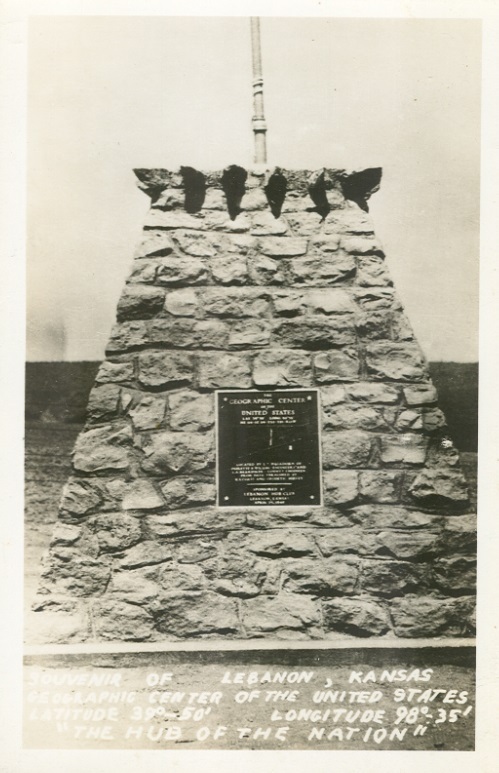 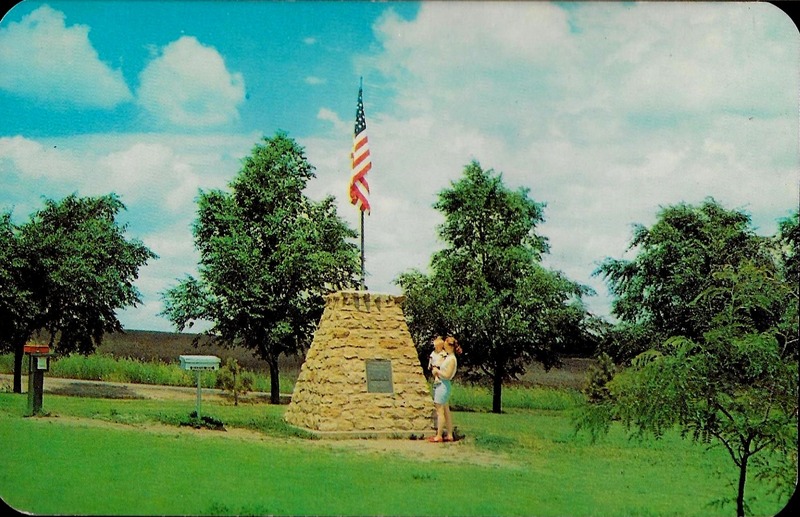 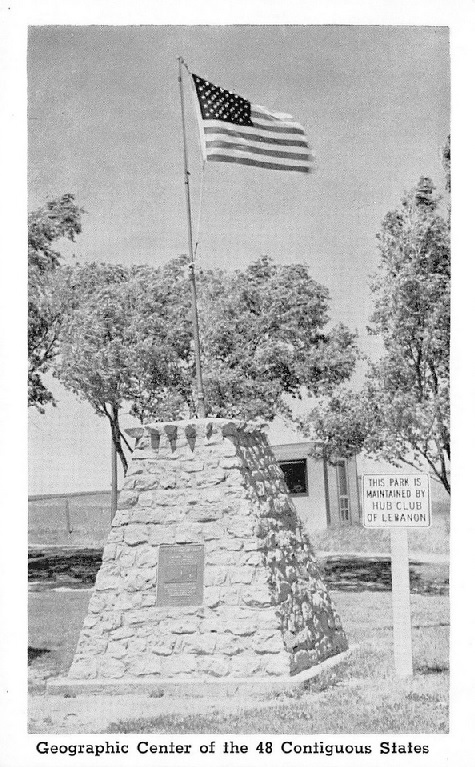 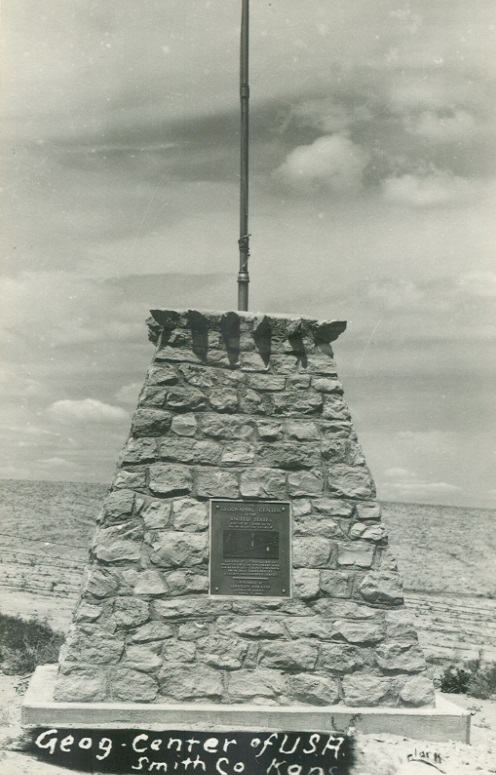 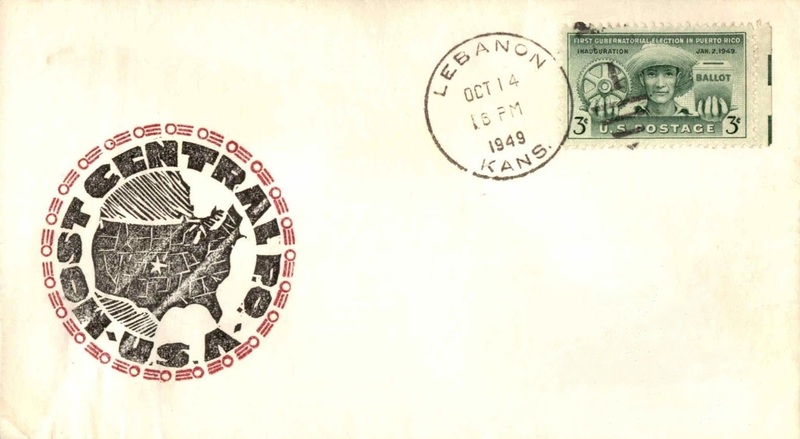 When the Geographical Center location was made to include the states of Alaska and Hawaii in 1957-58, to be near Castle Rock and Belle Fourche South Dakota, the monument at Lebanon began to lose its significance. 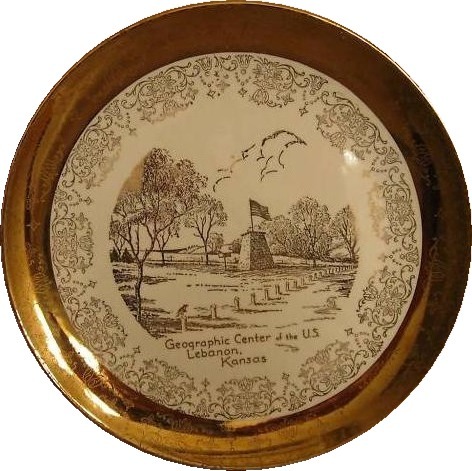 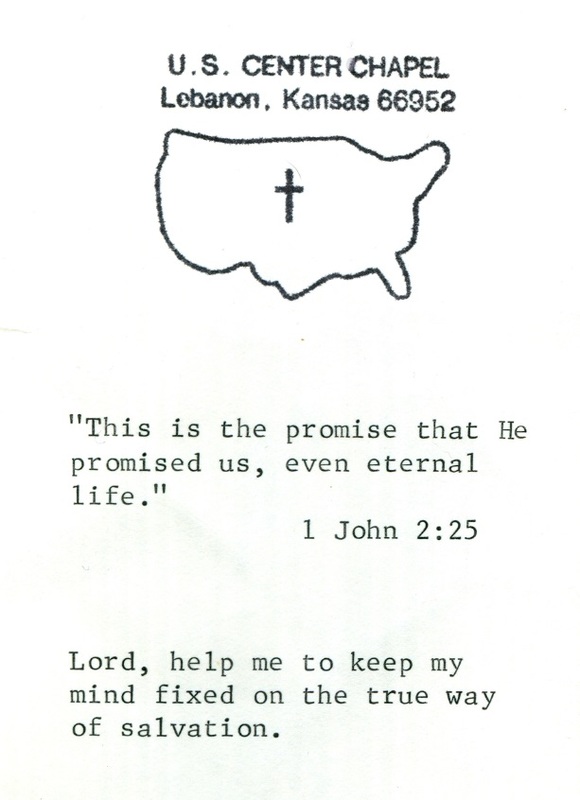 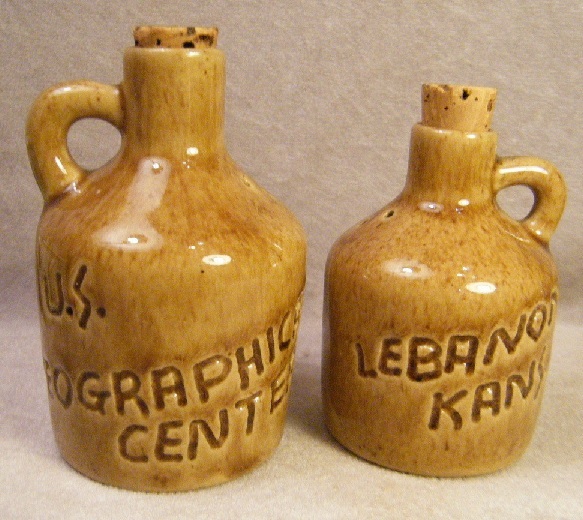 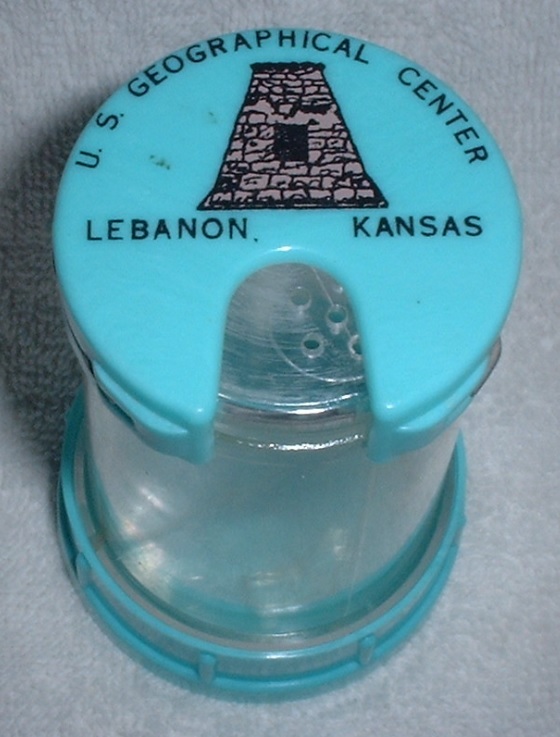 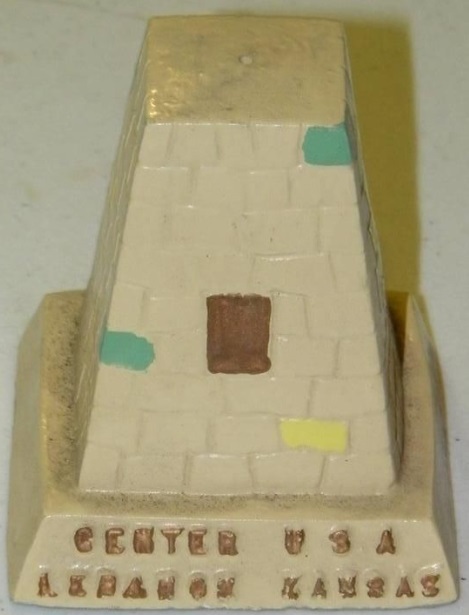 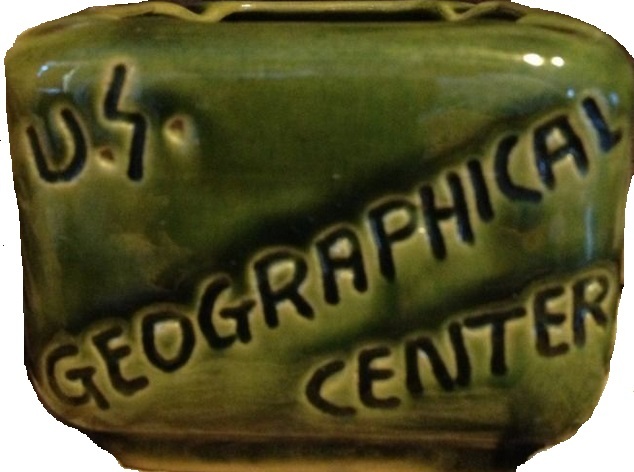 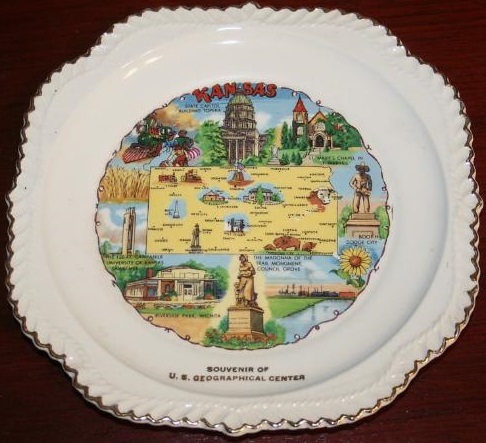 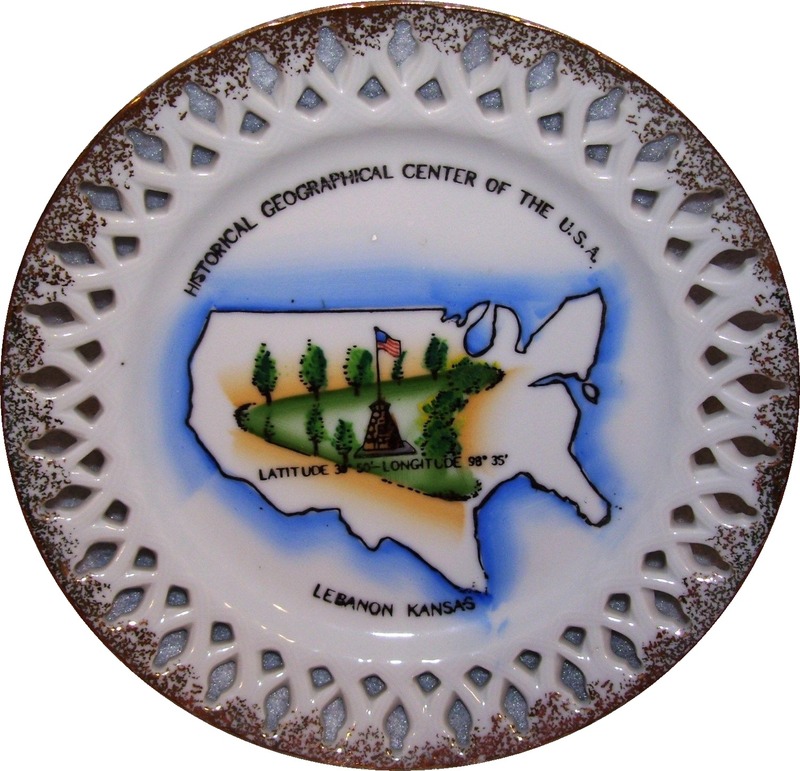 Promotional items were then required to add the words "Of the Continental United States" when referring to the location as the Geographical Center. 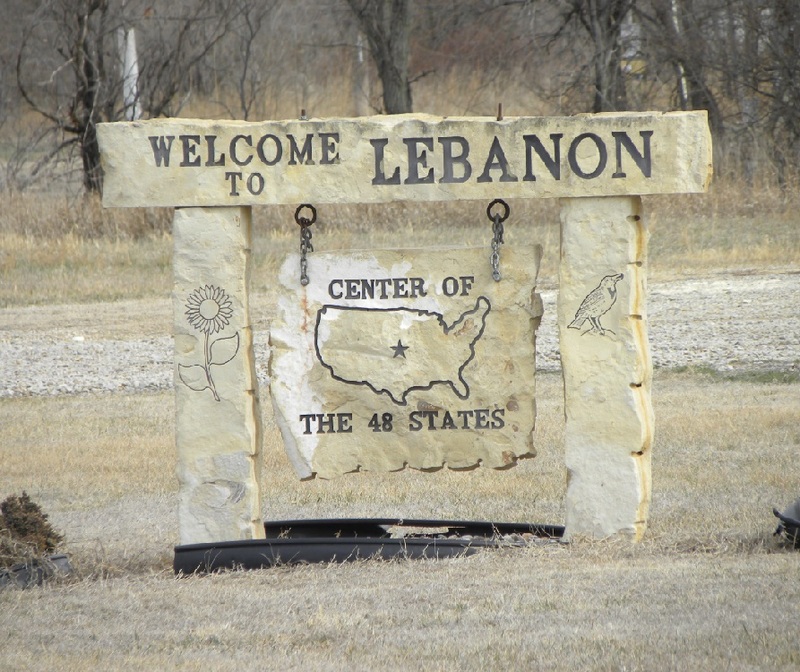 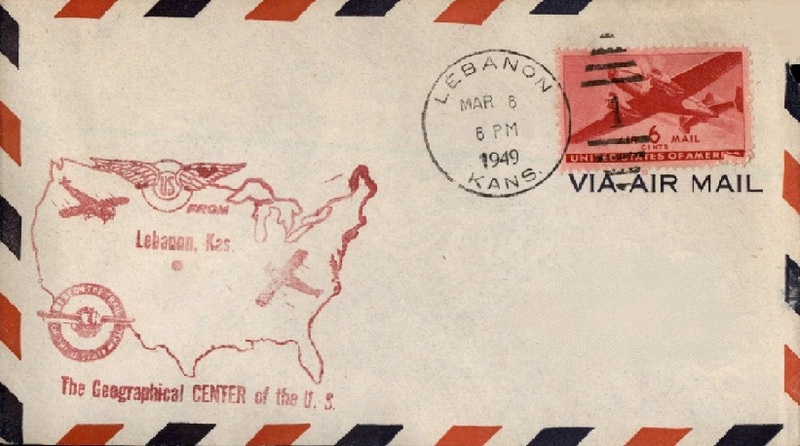 Nevertheless, the location at Lebanon continues to draw many visitors each year. 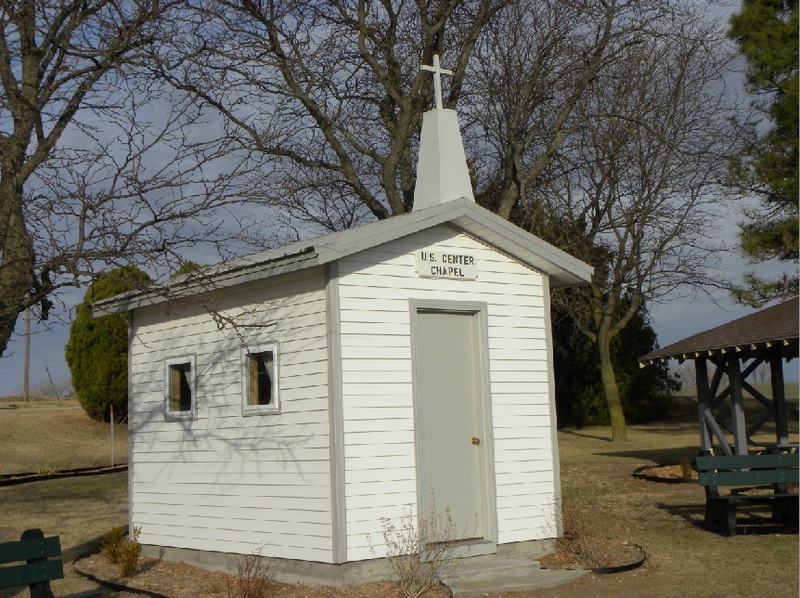 Over the years a chapel and picnic shelter have been added to the park. 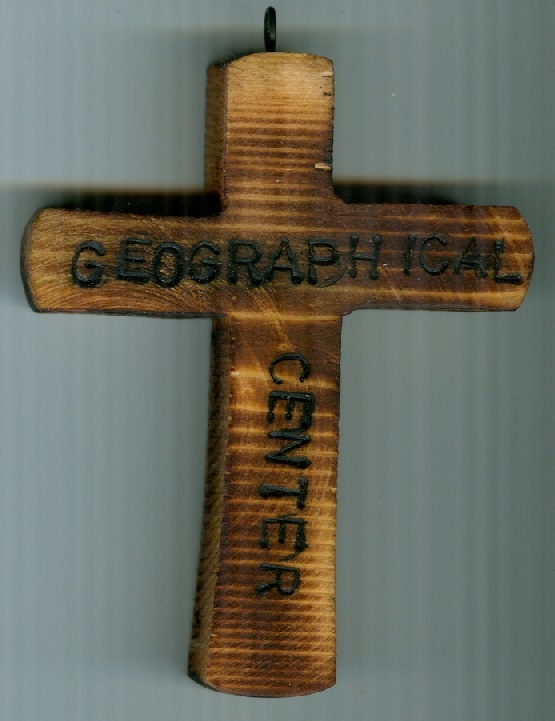 Approaching the Geographical Center Park from the east. 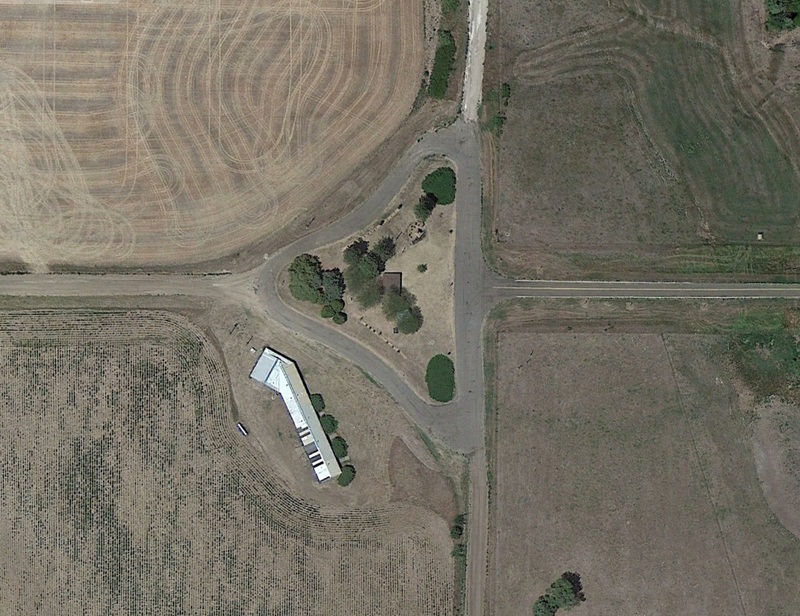 Aerial view showing the exact location in the field and the Geographical Center Park. 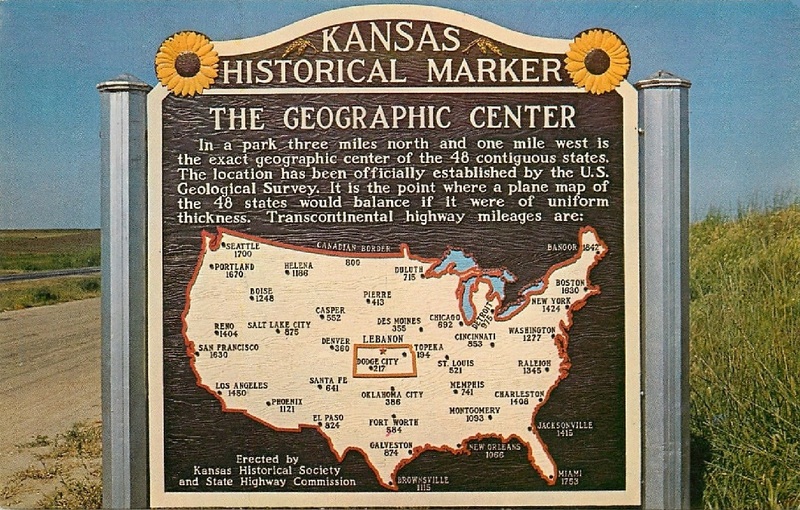 The Geographical Center Park. 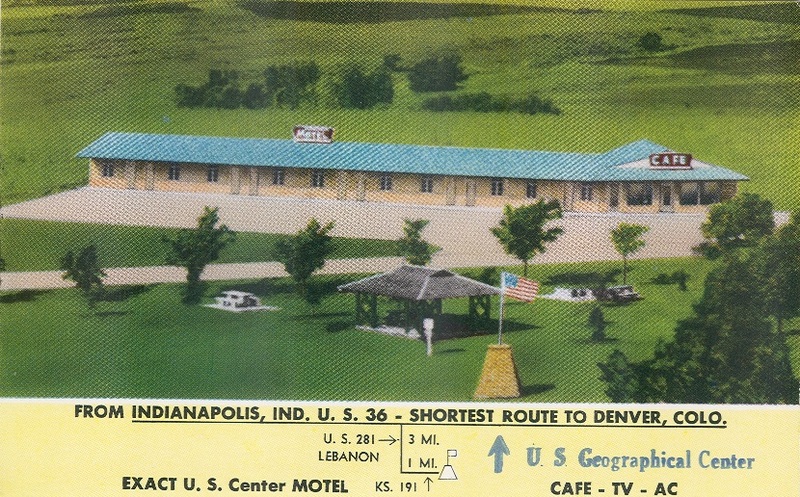 The former motel is at lower left. 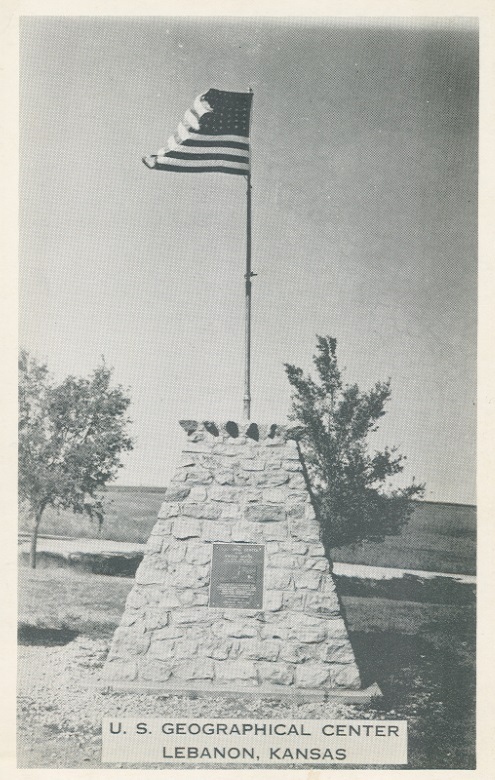 Monument built during the summer of 1941. 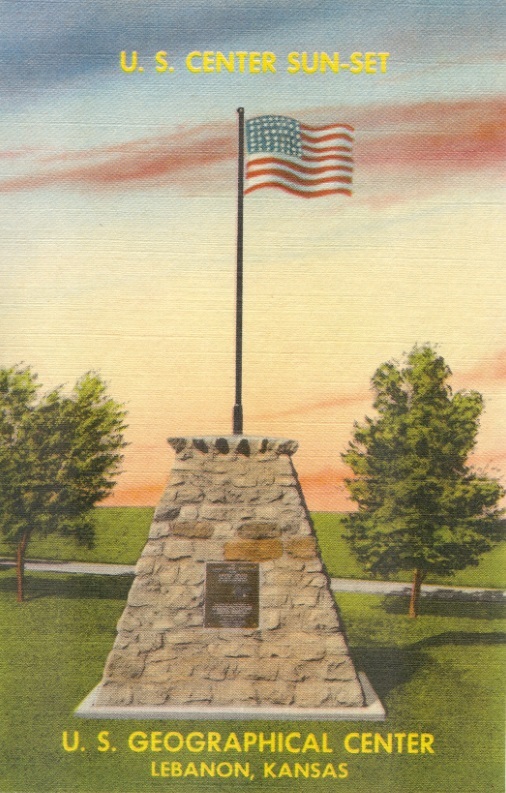 The bronze plate on the monument. 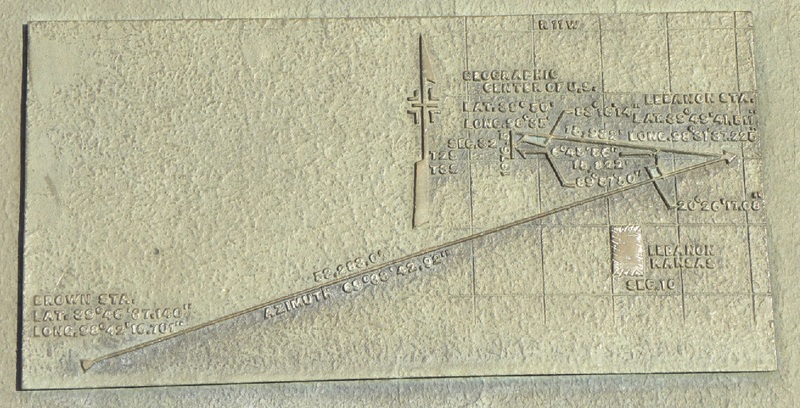 Detail on the bronze plate of the survey traverse to establish the location. 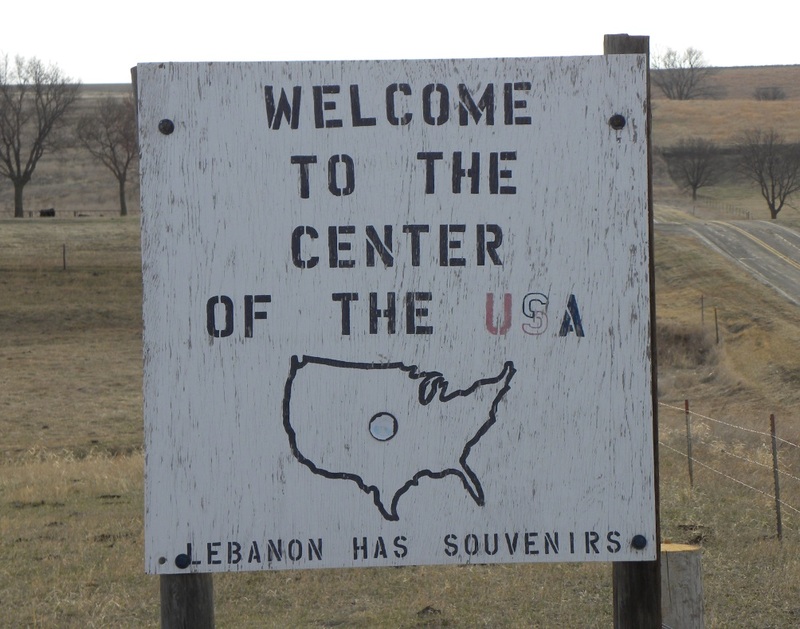 The exact and unmarked geographical center in the field in relationship to Lebanon and the park. 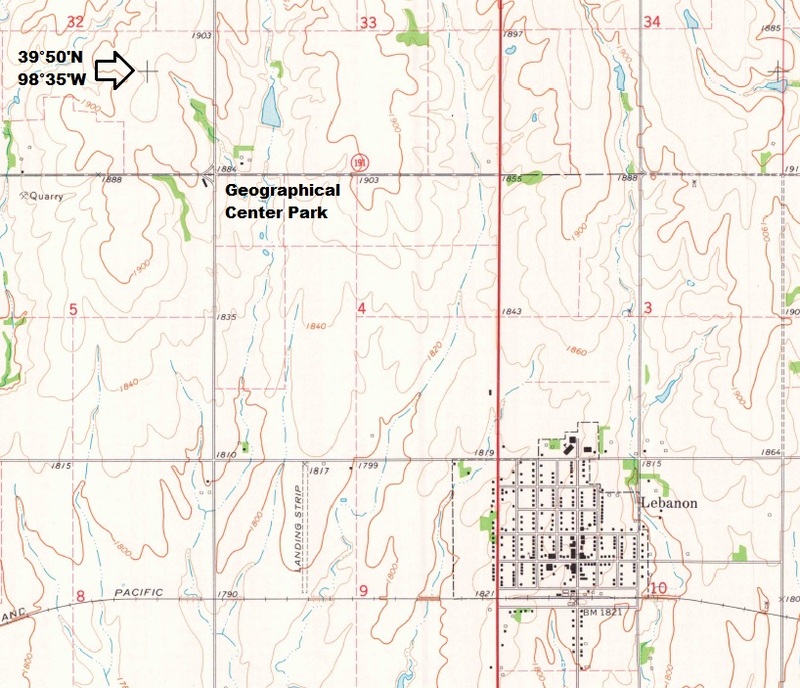 U. S. Geological Survey 7.5-minute topo quad sheet. 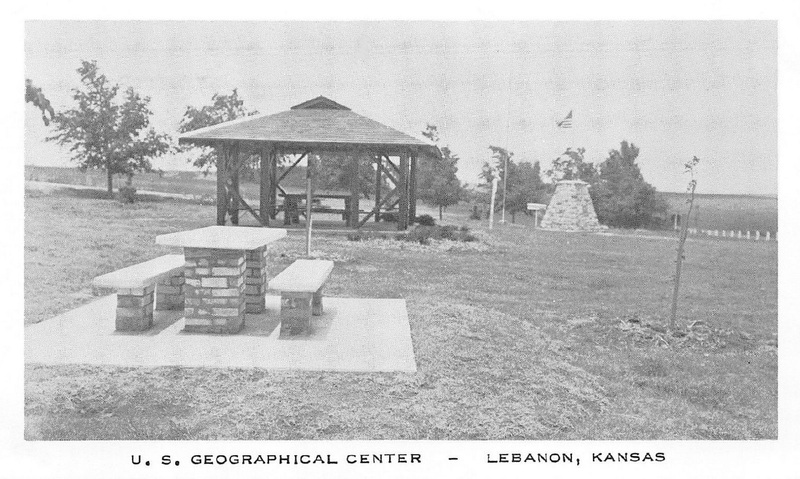 U. S. Center Chapel located in the Geographical Center Park. 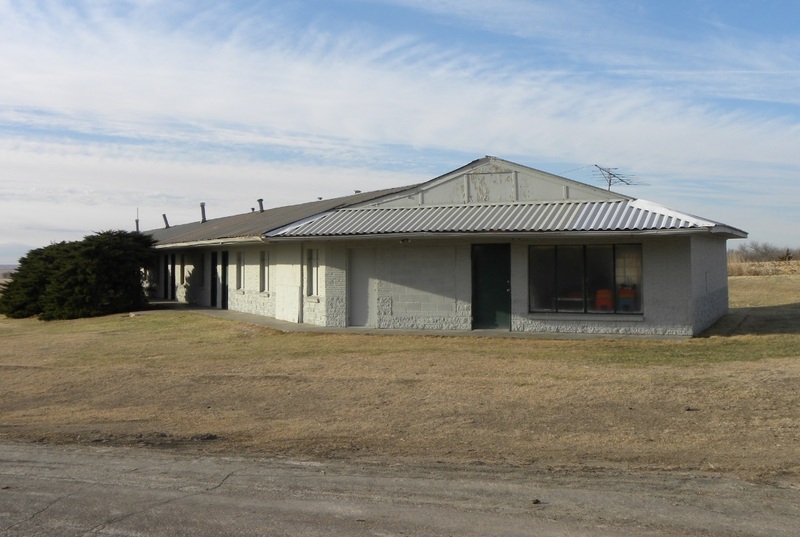 The front entrance to the former motel. 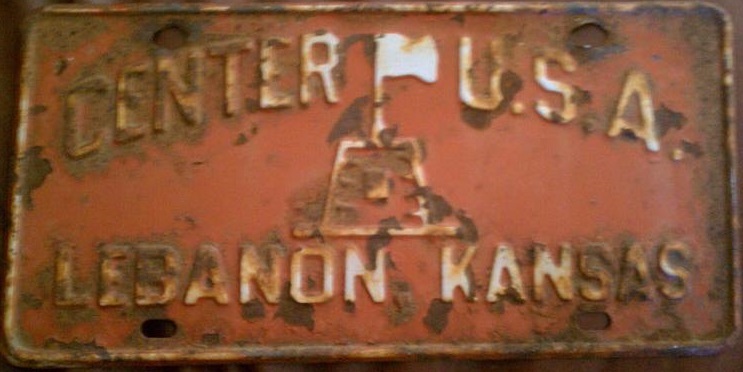 Sign located near a fence east of the park. 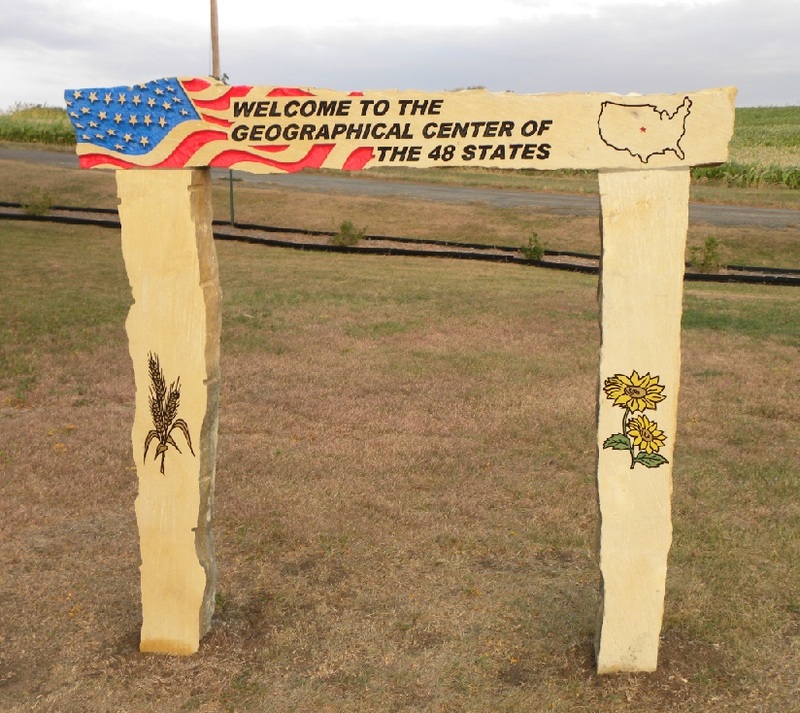 Limestone marker stating the monument marks the "48 States". 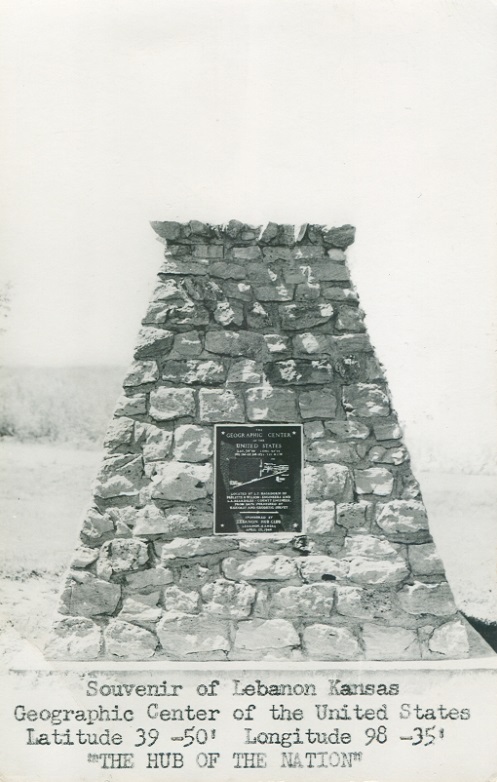 Limestone marker located in Lebanon along Highway 281. 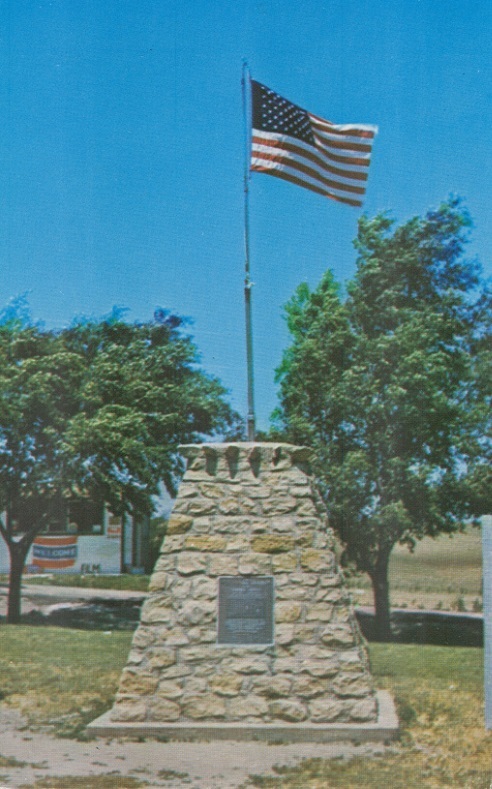 Sign in the roadside park along Highway 36. 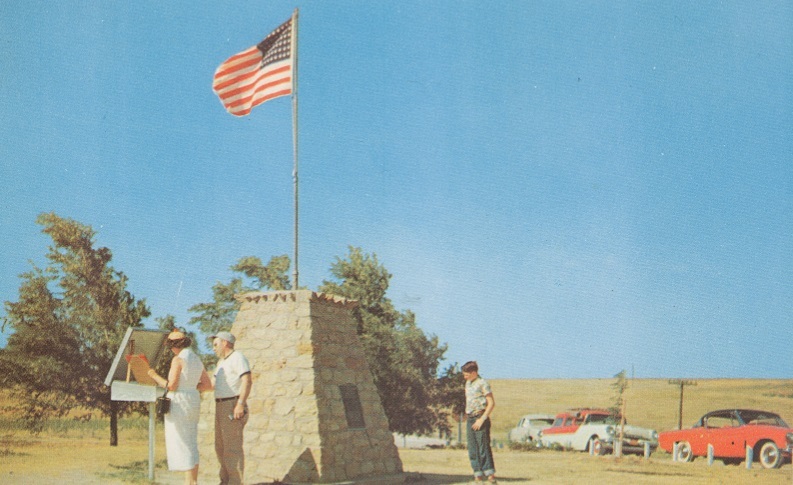 John Grieb posing at the monument a short time after it was placed. 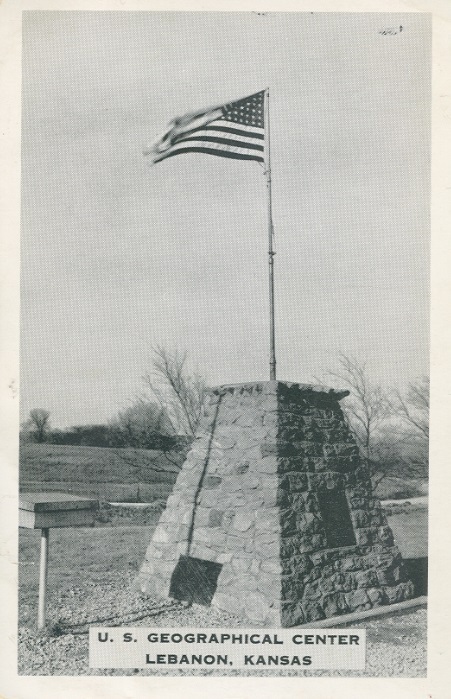 Grieb owned the land where the monument and true location in the field was located. 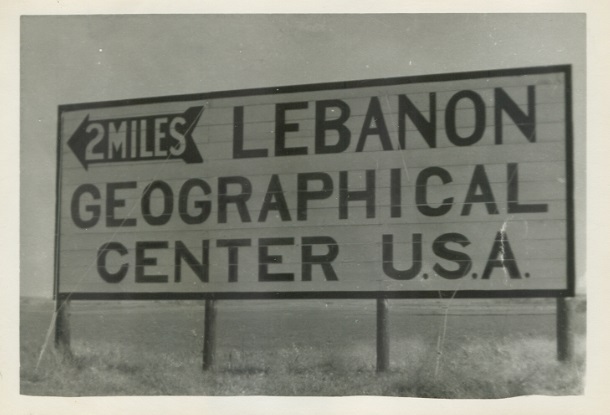 Photo courtesy of Smith Center Public Library.